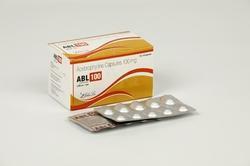 Prominent & Leading Manufacturer from Mumbai, we offer acebrophylline 100 mg capsule. Acebrophylline, a xanthine derivative, is prescribed as a bronchodilator for the treatment of asthma, bronchitis, chronic obstructive pulmonary disease, tightness in chest, lungs inflammation, and other conditions. It is also used when a patient feels difficulty in breathing. Acebrophylline regulates surfactant production by reducing the bronchial obstruction. It also works as an anti-inflammatory compound.